Neustrelitz, Germany, May 5, 2017. GAF AG provides worldwide high and medium resolution archive and fresh data through ESA’s Third Party Mission scheme. ESA and GAF AG , the exclusive supplier in Europe of optical Indian remote sensing satellite (IRS) data from several missions, have entered into an agreement that makes the data from several Indian missions available to scientific users via ESA’s Third Party Mission (TPM) scheme. The agreement encompasses European as well as worldwide archive data from the IRS-1C, IRS-1D and Resourcesat-1 missions, as well as archive and fresh data from Resourcesat-2 and Cartosat-1. Interested scientists can submit project proposals, together with associated data requirements, to ESA. 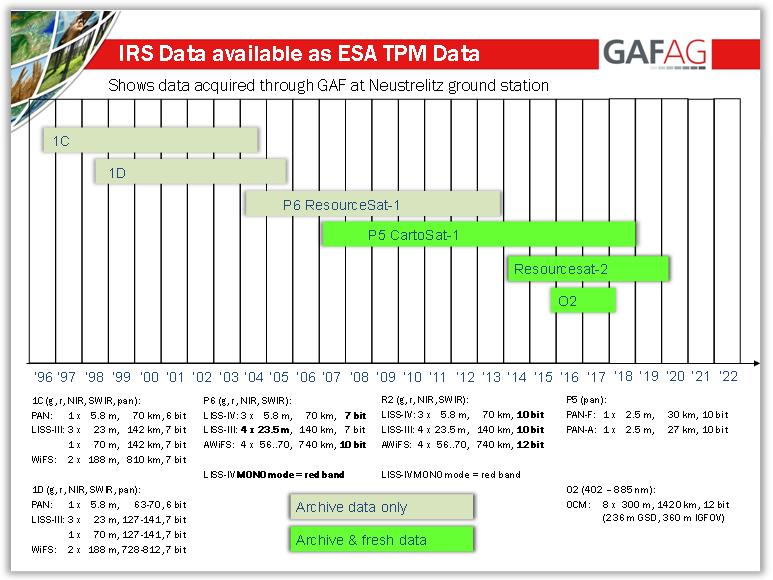 Depending on the scientific relevance of the proposal, ESA will grant the project a quota for IRS data products. This allows access at no charge to high-resolution data from the PAN, LISS-IV Mono and LISS-III sensors as well as medium-resolution data from the WiFS and AWiFS sensors, from 1996 until today. Data can be obtained at different processing levels, including Euro-Maps 3D digital surface models (DSMs) with 5 m post spacing. For more information, please visit https://earth.esa.int/web/guest/pi-community/apply-for-data/3rd-party or contact GAF’s customer support via tpm@gaf.de. The above activities are funded by and carried out under the Third Party Mission scheme of the European Space Agency.